Formula 35*17449 Formula 35*23460 The formula number on the label identifies the ingredients used to make that particular product. Isobutane is a propellant used to dispense a product from a container. It is often used in concert with other propellants such as butane and propane. While isobutane is commonly known for its use as a fuel, for example for camp stoves, in use as a propellant its energy comes from being compressed in a can rather than from being lit or heated. Butoxydiglycol is a solvent cleaning agent that can also be found in household cleaners and degreasers. It works by dissolving the residue that remains on bathroom surfaces such as oils and soaps. It's particularly good at removing soap scum. Polystyrene polymer is a film former that works in combination with rinsing water to keep surfaces cleaner longer. It works by first attaching to the surface, and then helping to prevent soils from attaching so that they can be washed away by water. 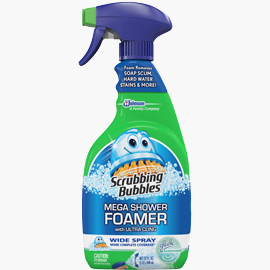 It is especially good at helping prevent soap scum from adhering to shower and sink surfaces.